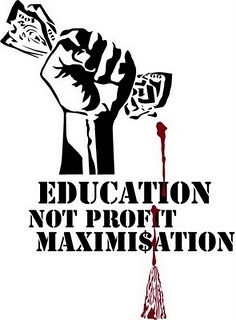 Rouge Forum Update: On to the March 4th Strike To Transform Education and Society! On to The Twenty Tens! “When everyone is dead, The Great Game is finished, not before.” Kim, speaking for Kipling. No Charges Filed in Attack on UC Boss’ House: “Eight people arrested after protesters vandalized the campus home of the UC Berkeley chancellor have not been charged with any crime and may never be, according to the Alameda County district attorney’s office. Read the complete RF Update here.